Finn Arnold was always drawn to music, having been raised in family where it was not a question of whether you played an instrument but which instrument you played. While—by his own admission—not as talented as his siblings, he focused his energies on recreating vs. creating music. As a student majoring in electrical engineering and minoring in music, this resulted in learning how to program a computer to synthesize the sound of musical instruments. Later, during his career with Bose, it meant working with teams of engineers to build products that would deliver superior sound through technology. Arnold learned during his 35-year career that his greatest satisfaction came from being a conductor and an instructor, leading teams whose talents and energies together could create something bigger and better than anything they could do on their own. As a manager, a mentor, and—at the heart of it—an engineer, he was driven to lead in a manner he calls “on resonance.” Now that he’s retired, he’s searching for that next wave: sound, or otherwise. It began with a chip. As a teen growing up in the small town of Harvard, Mass., Arnold heard that Radio Shack was selling a kind of synthesizer on a chip. This, he thought, would be his chance to play with sound. A synthesizer would be cool and it inspired dreams of a new endeavor. He bought the little wafer-thin device, with prongs that were meant to plug into a circuit board, and realized when he got it home that he had no clue what to do with it. So he began researching. He learned about resistors, capacitors, and proto boards—also learning how to interface them to a TRS-80 computer. But just a couple of years later, college would consume his focus in the same way the synthesizer did. WPI gave him the opportunity to flourish. His older brother was a student at the school, so Arnold knew all about the science focus, and loved the idea of solving engineering problems, from both a technical and a theoretical perspective. Plus, he says, WPI had a way of teasing out the best in students. His love of music grew, as he learned about the mathematical formulas behind it. His Humanities Sufficiency project allowed him another chance to explore the synthesizer. He was intrigued by the concept of trying to create something from nothing. He wondered: Can you understand sound to the point where you can rebuild it? For his project, he transposed an entire piece of music, mathematically describing each instrument and note in order for the computer to actually create the music. He says he learned a great deal from one electrical engineering professor in particular: Dan Wolaver, who pushed him to be a better engineer. Wolaver was experienced in the industry, which allowed him to help students understand the difference between theoretical engineering and how a project might actually manifest in the real world. “He helped you tease out your own thinking,” says Arnold. In his senior year, Bose came to campus to recruit. For Arnold, the notion of working for the audio electronics company, known for investing deeply in its projects and its employees, was a dream that would allow him to combine the two things he was most passionate about: music and engineering. The on-campus meeting led to multiple visits to Bose, for a tour and subsequent interviews. While there, he saw two cutting-edge technologies for 1983—a noise-cancelling headset prototype, and a Sony CD player—and was in awe of both. Once hired, he got to work on, even came to oversee, projects just as cutting-edge in their own right. Arnold built his Kitfox Series 7 with his three sons over a 2 1/2 year span (its maiden flight: 2010). He admits, “it’s the small adventures and the opportunity to share the unique perspective with a passenger” that keeps him flying. In his early days as an engineer with Bose, Arnold was in the automotive division, bringing high-quality music to cars. At the time, the company would partner with car manufacturers, working closely to design a stellar audio system. Today good sound systems are often expected, but back then, Arnold recalls, the Bose engineers were pioneers. In the late ’80s he worked on a noise-cancelling headset that was aimed at private pilots. 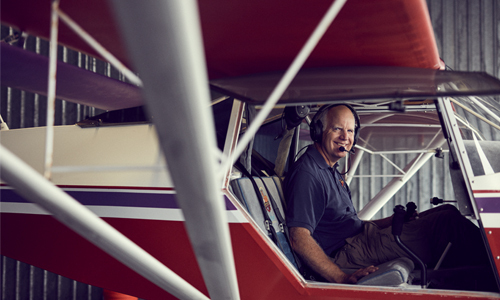 He’d recently earned his own pilot’s license, and recalls telling other aviators that the headphones could make them fly faster. “When flying long distances, I would limit how fast I would fly the plane, because it got pretty noisy,” he says. “Of course, with noise-cancelling headsets, I could fly whatever the limit of the plane was” To him, that truly meant flying faster. As his experience grew, so did his responsibility, and Arnold was soon leading departments: as chief engineer responsible for product development in the automotive division; as head of acoustics research; as director of product development for the home entertainment division (filing for about 20 patents along the way). In time, he became vice president of research and emerging business, overseeing a team of more than 150 engineers, scientists and creative entrepreneurs. Carvajal thinks back to a project he worked on with Arnold, called VideoWave. The goal was to create a simplified in-home theatre with a flat-screen television that gave off incredible sound. The resulting product was so expensive it was never a commercial success. But from a quality and satisfaction viewpoint, he recalls, it was a winner. “The product knocked everybody’s socks off, including ours! Every time they would develop it further, they would improve it in ways we'd never imagine possible. We were all blown away by what the engineering team was able to do,” he says. Arnold says the project was one of his proudest moments in management. The evolution of the project reminds him of the fable “Stone Soup,” when the townspeople each brought something of value to the pot. When there was a challenge for one engineer (the array didn’t handle high frequency sound well), another engineer stepped up with technology (phase guides) that could solve the problem. “It got better and better and better as it went through the system with people excited to be part of it,” he says. It was, in other words, on-resonance. Jody calls the workshop my happy place. It's where almost anything is possible! In her 15 years with Bose, Kathy Krisch, a director in the Bose Consumer Wellness division responsible for the hearing assistance business, also noticed Arnold’s knack for working with people. “He would be able to put the right people and the right technologies and the right goals in place and then kind of let ’er rip,” says Krisch. In fact, her division, which creates devices that help people hear better, is a new direction into the wellness space for Bose, and it’s something that Arnold helped move forward. He believed in the product, advocated for it, and made it a priority at the company. But he also leaves a lasting mark. Arnold acted as a mentor to Krisch, Caravajal, and countless others, encouraging them to bring the best out in people, just as he endeavored to do. Arnold retired last March after more than three decades at Bose. In the months since, he’s been tinkering. He’s fixing up the house that he and his wife, Jody (they met at Bose), designed and built. He’s working on the plane he assembled. He’s planning a trip to visit one of their three sons. At WPI and at Bose, that approach has worked out beautifully. He’s betting it will continue to do so, as he seeks to find his new resonance.